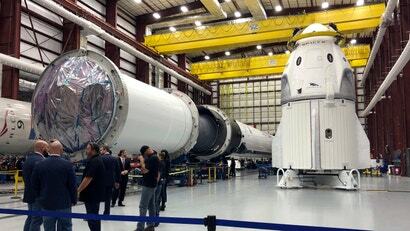 The flight date, aboard a SpaceX Falcon 9 rocket, is scheduled for 2:48 a.m. ET on March 2, at NASA’s Florida-based Kennedy Space Center — with backup dates of March 5, 8, or 9 if the mission is delayed due to technical problems or poor conditions on the day of the launch. That puts SpaceX well ahead of competitor Boeing, whose CST-100 Starliner isn’t scheduled for its first uncrewed test date until April. That month, SpaceX is planning tests of the Crew Dragon’s emergency abort system, which uses SuperDraco engines to propel the capsule away from danger in the event of an emergency. If all goes according to plan, which is far from guaranteed, Crew Dragon will be slated for a manned mission in July, according to Space.com. This isn’t the only big development from SpaceX as of late: Musk tweeted this week that it will use one of its Falcon 9 first stages for a record-setting fourth time during the emergency abort test, though he expected a “high probability” of the test resulting in its destruction.